Daily deals are growing like crazy, and it’s not just Groupon and LivingSocial. 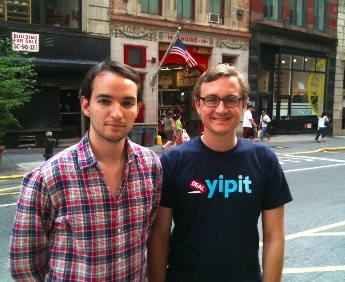 Daily deal aggregator Yipit just raised $6 million in a series B led by Highland Capital Partners. Existing investors RRE, DFJ Gotham and IA Ventures also participated. I caught up with co-founders Vin Vacanti and Jim Moran (pictured) today in New York City. Saved from Wall Street jobs a few years ago, they now work out of General Assembly with 7 people total, but are looking to ramp up to 30 (mostly engineers, Web designers, product managers, and mobile developers). They’ll have to move out of General Assembly and are already looking for their own space. Yipit tracks 335 active deal services in 32 cities in North America. In New York City alone it lists 161 active deals. People are starting to suffer from daily deal overload. There are only so many daily deal emails that even the most die-hard deal seeker can look at every day. There’s Groupon and LivingSocial, but also Gilt City, Yelp, and newspapers like the New York Times are getting in on the deal-a-thons. And then there’s Yipit, which brings all of the deals together in one place, lets you search and filter them, and sends you one email with deals from all the sites operating in your area. Vacanti and Moran compare Yipit to a Kayak for daily deals. It is daily deal search. You can filter out all the deals you don’t care about (no more spa deals, please) and not have to go to each individual deal site. Then those daily deal search results are sent to you all together in one regular email. Yipit normalizes data for every deal and puts it into its own database. Every deal has an address and lat-long coordinates attached to the venue, which could come in handy for a future deal-finding mobile app. Yipit also has a lot of great data on the daily deals industry, which it sells to hedge funds and daily deals sites for competitive intelligence. The reports are currently half its revenues, which is at a run-rate of hundreds of thousands of dollars a year and growing quickly. The company was already close to break-even and had 15 months of cash left when they decided to raise the new money, which will be invested primarily in hiring and growth to new cities.